Our Lebanon office is located at the southeast corner of Main and West Streets, one block southwest of the courthouse square and diagonal from the U.S. Post Office. Take I-65 South to the first Lebanon exit (exiting from the passing/left lane) which is Lafayette Avenue. Take Lafayette Avenue south until it Ts with Main Street. Turn left on Main Street and go to the stop at the intersection of West Street. Our building is the first one on the right after crossing West Street. Take I-65 North to the second Lebanon exit (Exit 139/State Road 39). Travel north on SR 39 (Lebanon Street) to the second stoplight at the intersection of Main Street. Turn left on Main Street. Our building is the first building on the left. 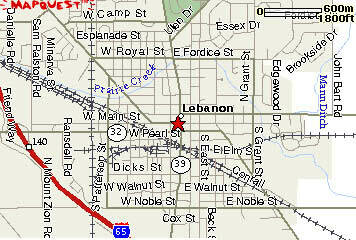 Take State Road 32 East into Lebanon to West Street (one block before the SR 39/SR 32 intersection). Turn left on West Street. Our building is the building on the right at the intersection of West and Main Streets. Take State Road 32 West into Lebanon until it Ts with Indianapolis Avenue. Follow SR 32 by turning right on Indianapolis Avenue and then by turning left on South Street. At the light at the intersection of State Road 39 and State Road 32, turn right (north) on State Road 39. Travel one block to the intersection of Main Street. Turn left on Main Street. Our building is the first building on the left.